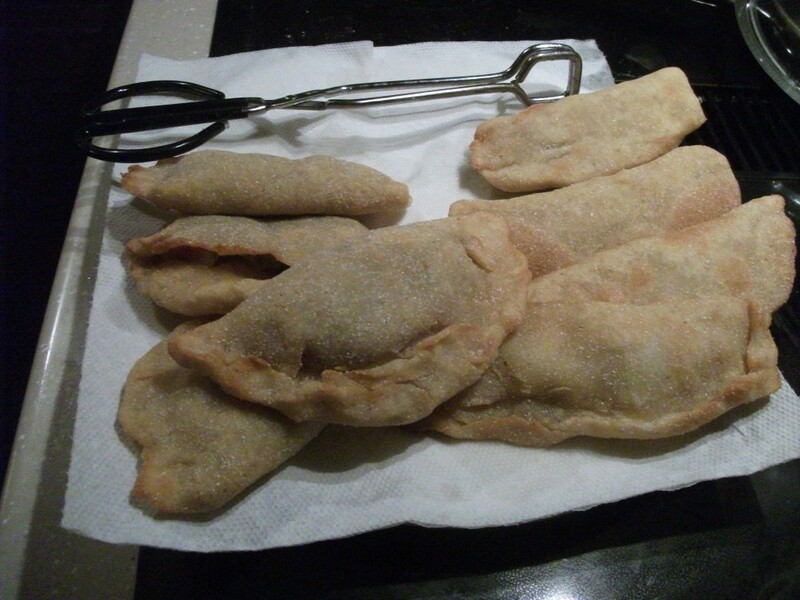 My love for Empanadas has been well documented. Though I ate many in South America, I never did learned a recipe, but I do consider myself an expert on what style is the best. I had an opportunity to make some the other day and photographed the event, thus the following is a rough version of my recipe. There are a couple different parts – The Filling, The Condiments, and The Dough – so I will do each separately and quickly. I must admit though, that I don’t remember exact measurements or even ingredients, so this may annoy some people. Also, I made way too much filling so please take it down a notch if you try this at home. *One alternative (easier) method, would be to use Ground Beef instead and do it all in a frying pan. You could also just cook the roast however you want. The whole goal is to get everything cooked, diced, and mixed together. But here is my method. Step 1: Heat Oven to 375, throw some butter into warm roasting pan, place Meat in pan, brown meat on sides while chopping veggies, Dice Potato and Onion (very small) and put into pan, add water and a couple Bouillon cubes, sprinkle some seasonings and hot sauce on top, After 30 minutes – reduce heat to 300 and let Bake for another hour. 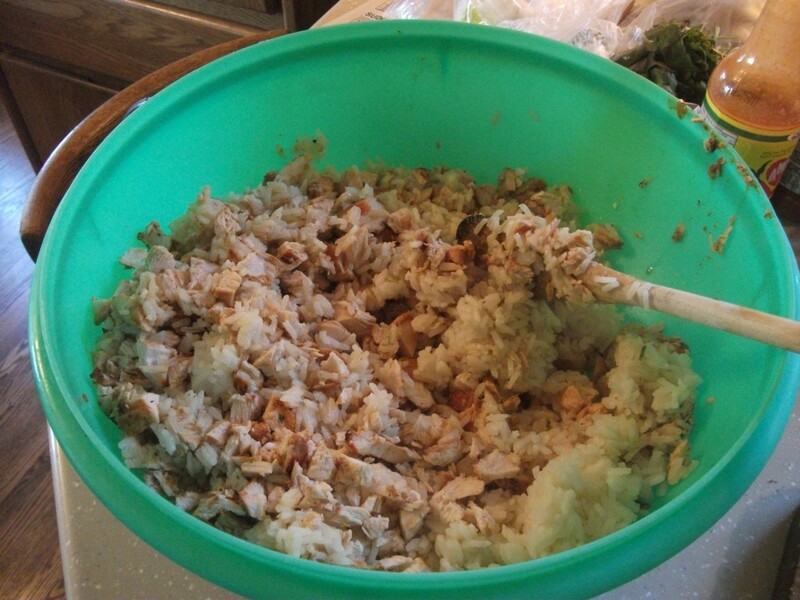 Step 2: When Potatoes are cooked, remove them and onions to large bowl and check meat doneness. Put meat back in if necessary, otherwise you can let your meat cool before finely dicing – then to the bowl with it. Save the remaining broth. Step 3: Hard-boil the Eggs, let cool, remove shell, do the “sign of the cross” to show remorse for killing an unborn chicken, dice’m, then into bowl. -Now you make the “Hogoa” sauce to mix with filling. Step 1: Heat oil in saucepan, finely chop everything, add all to pot, stir and let cook for a few minutes. *You don’t want the filling to be too dry, so add as much broth as necessary to increase the volume of your Hogoa. Step 2. Add sauce to filling bowl and mix together. Filling #1 is now done and can be set aside or in fridge until packing time. Step 1: Marinate chicken in some hot sauce for a few minutes before throwing on grill. Step 2: Cook until desired doneness. Chop into small pieces and place into large bowl. Step 3: Use bouillon to make 4 cups of Chicken broth, add butter, Cook the rice in the broth until all liquid is absorbed. 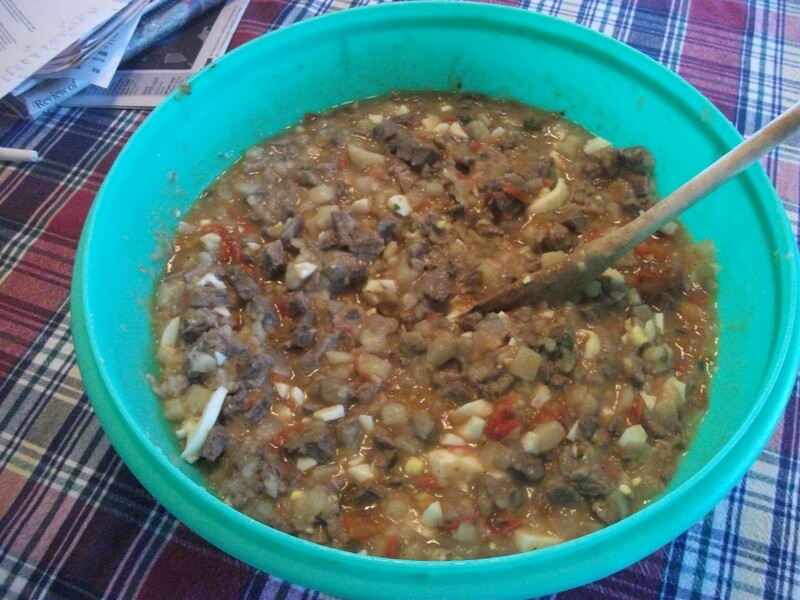 Step 4: Combine all in large bowl and mix. Step 1: Place Tomatillos, Jalapeños, and Garlic into a thing that processes food. Grind them down to a liquid. Step 2: Pour processed food into a saucepan and add Broth – Cumin – and any other spices you like. Heat through. Step 3: Pour sauce over Chicken & Rice. Stir. Set aside. Everybody has a version of this and I encourage you to search the web and find one that’s right for you. But here is quickly what I did, though it might not be accurate. The dishes all tend to run together in my memory. Step: I pureed everything (the zest of 1 lime and the juice of both) in the Processor so that it could be easily spooned into an Empanada. Turned out ok, probably too much lime and could have used some more heat. Set aside. I love Mayonnaise and the wide variety of mayo based toppings is one reason I loved eating Empanadas in South America. Theirs mostly had a greenish tint so this recipe will not recapture that glory. Step: Add all to food processor and mix well. Using a funnel – put mixture back into squeeze bottle. I don’t have much experience with dough, so this was adjusted on the fly. Step 1: Combine 2 cups of Corn meal + 2 cups of Flour, into your mixer bowl. Heat broth to a boil- add brown sugar. Step 4: Grab a small handful, form a ball, flatten with roller (constantly dusting where sticky), They don’t need to be perfect circles. Heat lots of oil in a pot and deep-fry ’em. It is best if they can be fully submerged. Cook for 1 – 2 minutes – or until golden brown. Let them cool a little as inner contents may burn your mouth. Enjoy them with your condiments and eat with your hands. Results: Good. They had that corn-meal flavor – which I will argue is the best way to go. Though, I will tinker with other varieties of corn flour products in future preparations. The Mayo topping was great and really complements the meal for me. 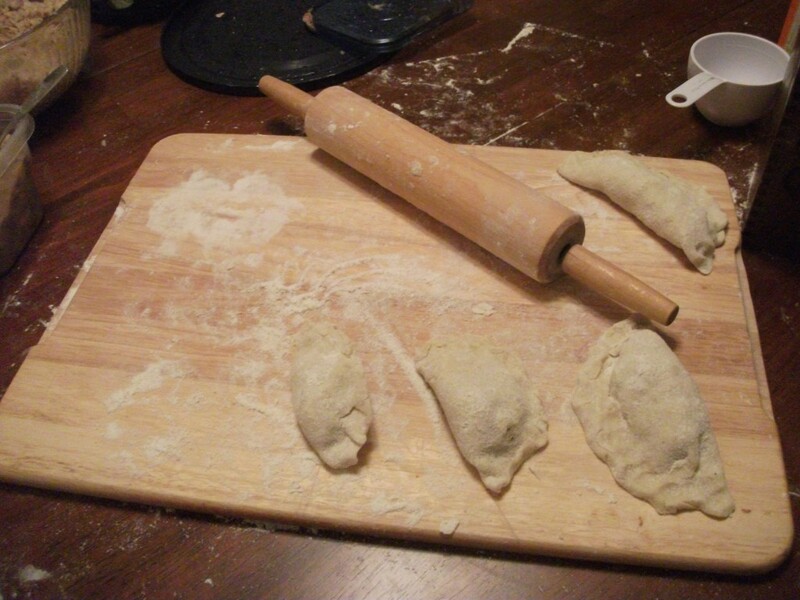 Being my first time, the whole process took too long, but once you have the large batch of filling, it become fairly easy to mix up some dough, fold ’em, and fry ’em.